Florida bans imports and lifts catching restrictions of these intruders from the Indian and Pacific oceans. A legal crackdown on the lionfish starts today as state wildlife officials attempt to control the spread of these voracious invaders from the Indian and Pacific oceans. The Florida Fish and Wildlife Conservation Commission has banned imports by aquarium stores and lifted restrictions on catching them to make it as easy as possible for divers to spear them. Though the spines, which are removed during the cleaning process, are venomous, it has no effect on the lionfish meat which is considered a delicacy and cooked in a variety of recipes. The new rules come too late to stop Florida&apos;s coastal waters from being hopelessly infested. But state wildlife officials say they may stop the problem from getting worse and allow lionfish to be eradicated from some local areas, particularly coral reefs. "They tend to move onto reefs and eat up everything that&apos;s on it, including parrotfish that eat the algae off the coral," Amanda Nalley, spokeswoman for the wildlife agency, told the Orlando Sun-Sentinel. "If you don&apos;t have parrotfish, then you have too much algae on the coral. They also compete with important predators, especially economically important predators like snapper and grouper." The "lionfish" infestation actually involves two closely related species, the red lionfish and the devil firefish. Arriving in Florida via the home aquarium trade, they are thought by authorities to have been released by owners who no longer wanted them—perhaps because the fish were eating other expensive and exotic fish. First found off Dania Beach in 1985, they have spread throughout South Florida&apos;s coral reefs, colonized the Gulf of Mexico and begun turning up in brackish coastal waters. 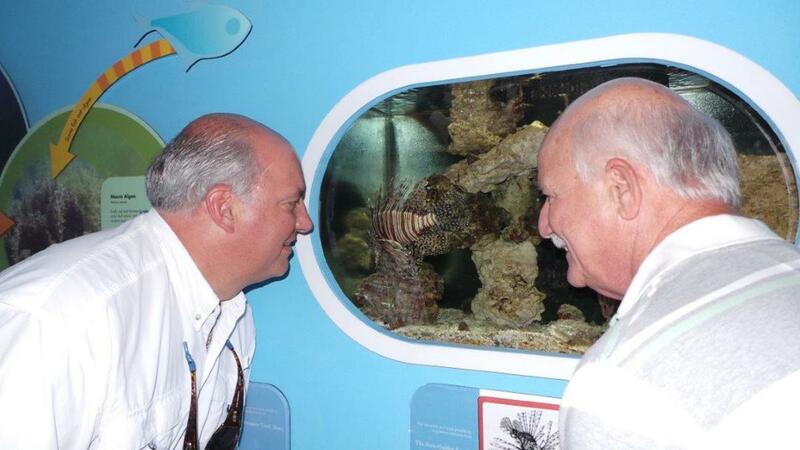 During a recent trip to Key West, U.S. Rep. Steve Southerland, R-Fla., who serves on the House Natural Resources Committee and its Fisheries Subcommittee, found that the two rapidly-reproducing and voracious non-native lionfish species, imported from the Indo-Pacific region, are wreaking havoc on fisheries and marine ecosystems in the Gulf of Mexico, Western Atlantic and the Caribbean Sea.